Throughout your search for managed IT services for your business, there are many steps you’ll take to ensure you're getting the best managed IT services specific to your business goals. You’ll eventually come to one of the final steps of the process which is looking for the best managed IT services company nearest you. Sure, there are probably tons of managed IT service companies near your business that provide the technology your business needs. 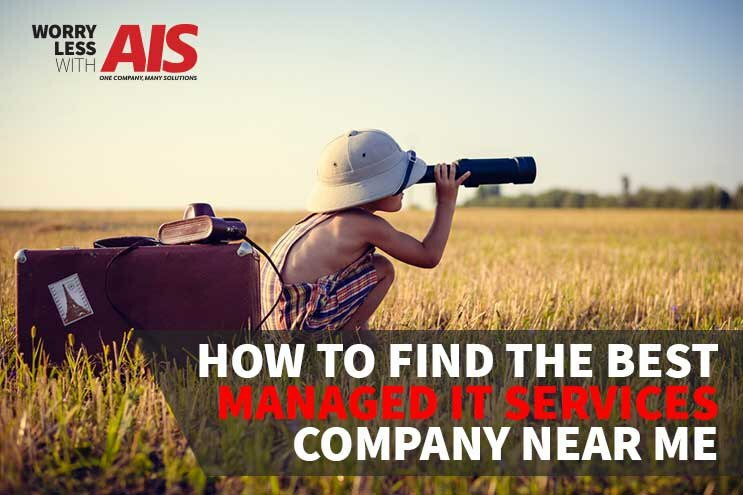 However, how can you be sure you’re choosing the best managed IT service company, and how can you eliminate the bad ones? It’s important you ask yourself some questions as to what brought you to choosing the best managed IT service provider in the first place. Do you need managed IT services due to the growth of your business? Are you too busy to manage your IT department? Is your current managed IT services company (or IT person) slacking off, continuously letting you down? Are you fixing the same IT problems over and over again? Do you feel like your business is missing out on new features, updates, and apps that could make your day-to-day tasks easier? These questions are probably what you should be asking your IT provider, and it’s essential to find the managed IT company that will best serve you, your employees, and your overall business goals. If you’re still on the fence about outsourcing and managed IT services, read this article we recently published, The Top 5 Benefits of Managed IT Services. This article is an easy-read and breaks down how your business will benefit and grow, simply by using a managed IT services company. Don’t let the thought of someone else managing your computer systems and databases scare you. You’d be surprised how much work they can take off your plate and the peace of mind you’ll get knowing your office technology is in great hands. Most managed IT services companies focus on a multitude of managed IT services, making it a little more challenging when deciding which services and features are worth investing your time and money. Just because a company specializes in a specific service doesn’t mean they’re the best at doing so, and it also doesn’t mean those services will benefit your business. Take a look at some of the managed IT services we believe are the best to invest in, regardless of the size or type of your company. Day-to-day help desk support is one of the most fundamental things you can invest in when you’re talking about managed IT services. The whole point of outsourcing your IT department is so that someone who is qualified and knowledgeable can assist your network’s issues as soon as a problem arises. More times than not, an IT help desk can fix your issues remotely, without even having to make a trip over to your location. Matter of fact, a great managed IT services company can even identify a problem (and fix it) before you’re ever made aware of it. Being this proactive helps decrease the amount of downtime you might face by completely eliminating the issues before it gets in the way of you doing your job. If that doesn’t scream responsiveness, we aren’t sure what does! When you think of having peace of mind with managed IT services, one of the first things that probably comes to your head is data recovery and backup. What happens to your business if you lose access to your client and employee information, business intelligence data, financial records, corporate communications, and project plans and details? If you're like nearly every other business today, your business relies on network infrastructure, email communications, and digital documents–that’s a lot of data you need to make sure you’re information is backed up on a regular basis and you have a plan in place in case of disaster. Outsourcing a managed IT services company to provide cloud backup is a cost-effective way to ensure your business and files are safe and protected. Even if you have to adhere to strict compliance rules, such as HIPAA (for medical and healthcare businesses), or privacy concerns, there are cloud providers who specialize in providing compliant solutions. To learn a little more on data backup and recovery, read our eBook, What’s Your Data Backup Plan? Network management and email security are continually shifting targets, as hacking and cyber-security techniques and threats evolve. Companies that don’t have enough resources to dedicate to network security are even more at risk of a security breach (or breaches). Wouldn’t you feel better knowing there’s a system in place that continues to monitor all of your company’s personal and important documents? Email security also comes in handy, helping to block spam, phishing scams, malware, and other inappropriate email content before it can get inside of your network. With the way that technology is growing nowadays, it’s extremely important to have a solid security system in place that covers all of your office technology products and machines. It’s better (and much easier) to prevent a security threat from happening opposed to trying to get rid of it once your business is attacked. Are you interested in learning more about cybersecurity and how your business could be at risk? Read an article Digitalist Magazine published, The Five Most Common Cybersecurity Risks – And How To Fight Back. Another important feature to look for in a managed IT services company is the detailed reporting of your office technology that they can provide. Detailed reporting allows you to see the applications and personnel taking up the majority of your network resources and the demand for each piece of technology your employees use on a daily basis. Monitoring also provides insight into traffic bottlenecks and peak periods, so that you can add more capacity when needed and prevent your employees from becoming frustrated. The more you know about how your network resources and how your employees use them, the easier it is for your business to grow. Whether you’re ready to make the decision now to outsource your IT department, or if you’ve just started browsing managed IT services companies near your business, it’s so important to focus in on critical aspects each provider can bring to your company. Take your time as you do your research and don’t hesitate to reach out to the managed IT services companies that catch your attention. You have the power to choose the services that are best for your company and your business needs. At AIS, we continually look for the newest and best information to bring to our current and future customers. Our job is to serve you and help you establish your specific business needs to help you reach your business goals. We want your business to continue its successful growth and are here for you if you have any questions about managed IT services. To speak with one of our business technology consultants, reach out to us, here. Also, check out The Copier Channel for the latest videos on tech tips for your office copiers and printers. We’re here to give you peace of find to help you win more business.